The main protagonist is a high school delinquent who drops out of school and leaves Japan in pursuit of his love, Yumin. While in Korea he lives his life as a shut-in for an entire year being unable to find an actual job. After saving an old man from being killed by loan sharks, he was scouted and invited to join "Q" a local gang(gondal) to work under Tae-soo as one of his underlings. After fighting against Tae-soo, he was offered the position of boss instead. He initially declined since he wanted to join the police force alongside Yumin but Tae-soo eventually manipulates him into taking the position. His strength and sense of justice earns him the loyalty of his gang and the local community. As the leader of the Sun-Ken Rock Gang, he often hides his true identity from others (ex. : he tells Yumin he works at a video game company as a cover). Ken's parents were killed during a Yakuza war when he was 13. 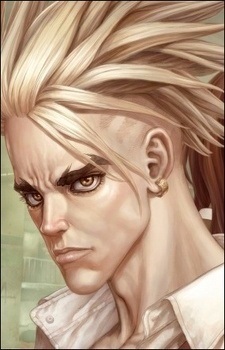 The character design of Ken is heavily influenced from Vash of Trigun Manga.